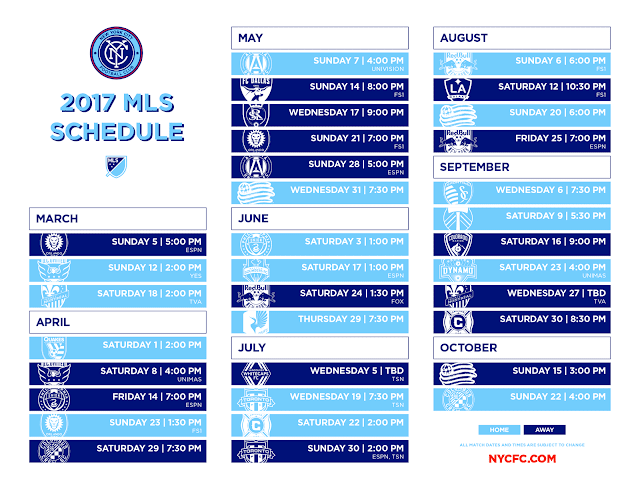 Today, the club released a revised schedule for 2017. The game on Sunday the 12th will now be broadcast on YES. Saturday the 18th against Montreal now has a start time: 2:00pm. Saturday the 1st against San Jose now has a start time: 2:00pm. Wednesday the 17th in Salt Lake now has a start time: 9:00pm. Wednesday the 31st against New England now has a start time: 7:30pm. Saturday the 3rd against Philadelphia now has a start time: 1:00pm. Thursday the 29th against Minnesota now has a start time: 7:30pm. Wednesday the 19th against Toronto now has a start time: 7:30pm. Saturday the 22nd against Chicago now has a start time: 2:00pm. Sunday the 13th at Los Angeles has been moved to Saturday the 12th at 8:00pm. 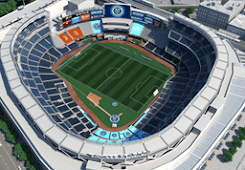 Saturday the 19th against New England has been moved to Sunday the 20th at 6:00pm. Wednesday the 6th against Kansas City now has a start time: 7:30pm. Saturday the 9th against Portland now has a start time: 5:30pm. We still have two time TBD matches, but both are on the road.